The Associated General Contractors of Ohio is a commercial construction trade association governed and directed by building contractors. Established in 1970, it is a full service AGC Chapter chartered by the Associated General Contractors of America, the oldest and largest national commercial construction trade association in the United States. A general contractor member is any individual, firm or corporation by agreement with another party undertakes to execute work of construction in its entirety and at least in part with his or her own construction forces. This includes traditional general contractors, as well as construction managers and design-build firms. Specialty Contractors are individuals, firms or corporations whose activities are directly related to the construction industry, who have mutual labor-management problems, and who employ personnel directly connected with the construction industry. Affiliate members, engage principally in the manufacture and/or sale of materials, equipment, and/or services used by contractors engaged in construction i.e. Accounting, Architects, Banks, Engineers, Equipment, Lawyers, Printing, Suppliers etc. The completed application must be accompanied with your annual dues payment or prorated 50% covering July 1 - December 31. 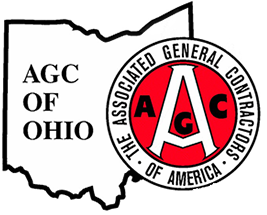 In order to process your membership application, you must provide one recommendation from a current AGC of Ohio member company. (Be sure to list the member on your application form.) To become a member of AGC of America, you must first become a member of a local AGC Chapter. Upon joining your local Chapter, you will automatically receive the added value of membership in AGC of America. The AGC of Ohio Board of Directors must formally approve all membership applications (board meetings are not held in the summer months). AGC of Ohio collects the dues for both AGC of America and AGC of Ohio memberships. You should receive something from AGC of America within 6-8 weeks. In the meantime, you will receive benefits of membership. You will receive AGC of Ohio newsletters, and information about upcoming programs, meetings and events. We encourage you to participate! You will learn more about commercial building issues, have opportunities to network with other AGC of Ohio members, save money for your business with our discount programs, and help effect positive change within the industry.